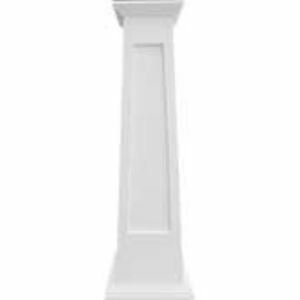 Royal Corinthian manufactures balustrade railing from 3 composite materials: high density polyurethane or RoyalThane, synthetic stone or RoyalStone, and cast fiberglass or RoyalCast. 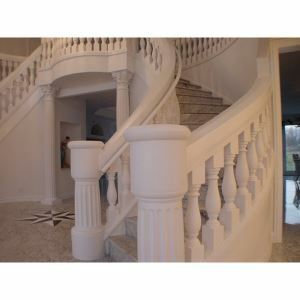 Royal Corinthian manufactures balustrade railing from 3 composite materials: high density polyurethane or RoyalThane, synthetic stone or RoyalStone, and cast fiberglass or RoyalCast. We offer 11 top rails and 11 bottom rails ranging from 4” wide to 10” wide, which results in hundreds of combinations of top and bottom rails. We never shy away from custom rails so let us know exactly what you need and we will make it. We offer all of the rails pictured in all 3 materials; however, polyurethane rails max out at 12 feet spans, whereas the other rails can span up to 16 feet and even 20 feet. Since our RoyalStone and RoyalCast systems have different structural characteristics than our RoyalThane balustrades, the internal layout and quantity of PVC pipe will vary. The drawings below show a typical RoyalStone/RoyalCast railing integral pipe configuration. In addition, bottom rails that have an open bottom will be closed off when made from high density polyurethane in order to maintain structural requirements per building codes. If you are buying our railings independent of the rest of the balustrade system, you may use whatever hardware you see fit for installation. However, when buying our balustrade systems, our synthetic stone and fiberglass systems use a concealed retractable pin method while our polyurethane railings use L-brackets that will be partially visible unless you notch out for them during installation. You can see the different installation methods in our installation instructions. All of our balustrade railings are available in 1 foot increments, which is unique: Most manufacturers make you buy a minimum rail length of 8’ which is wasteful when you only need 4’.